It's a strange week trying to figure out trends in the travel world. 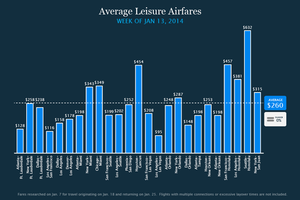 Leisure airfare is flat overall with a lot of price spikes. 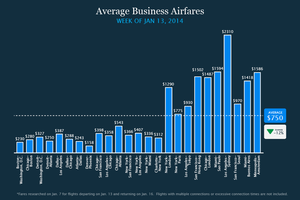 Business fares are down with a number of longer-route price jumps. Hotels are going up big with convention season heating up and cars are down overall, though again, it's deceiving as big-city prices are up, up, up. That's the overview for the Jan. 13-19 travel picture in the Murphy Travel Index. 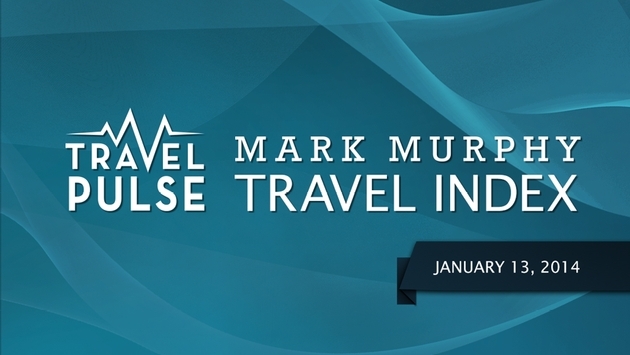 To be clear: Our numbers are based on research done last week looking for fares and rates for the Jan. 13-16 week, except for leisure airfare, which was researched looking ahead at flights for the week of Jan. 18-25. - Ticket prices are holding steady this week, as fares continue to remain flat following the highs of the holiday season. - Delta is the low price leader in this window, with lowest prices on eight of the 25 routes surveyed. Spirit is No. 2 this week with lowest prices on five routes. - Prices on most routes are either unchanged or down from last week, with the exception of flights between Dallas and Ft. Lauderdale (up 50 percent), New York ­ Orlando (up 20 percent) and New York to­ Miami (up 12 percent). - Fares are also up on flights between Seattle and Honolulu (up 45 percent), but prices to Hawaii are down on flights from both Los Angeles and San Francisco. - Southwest Airlines now has less expensive fares available; many seats were sold out over the holidays, driving the prices up on traditionally lower fare routes. - Allegiant Air will add six First Class seats on its 757s, but there will be no first class service ­­-- it’s just a larger, more comfortable seat. The main cabin will soon be refitted with the dreaded slimline seats. - Over at Delta, the airline is removing 7 business class seats from the 777s in order to add 23 more Economy seats, while the 767s are losing 12 business class seats in favor of 20 additional Economy seats. Expect upgrades to be harder to come by, since there will be more Economy class passengers competing for fewer comfortable seats. - Overall, fares are down 12 percent from last week, but prices are beginning to creep up as business travelers head back out on the road. - U.S. Airways continues to be the low-price pace leader, with lowest fares on six of our 25 routes surveyed. Spirit has lowest prices on five of 25 routes. - Ticket prices are up 56 percent on flights between Chicago and Atlanta, and fares into Detroit are also at a premium, as visitors jam the city for the North American Auto Show. - As the mercury climbs Down Under, so do ticket prices between L.A. and Sydney (up 11 percent from last week), but fares are down on most international routes for travelers willing to make a stop along the way. - It's the first time we've seen flat prices overall on airfare (leisure), but business prices are their lowest since early December. - As we said, prices are flat week to week, holding at $260 on average, the lowest prices since we began tracking. 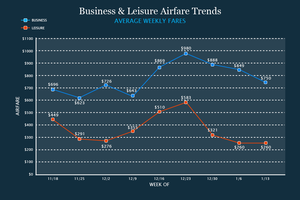 - Business fares are down for the third straight week, dropping $99 overall on average from last week and now just $127 higher than our lowest weekly average ($623 week of Nov. 25, 2013). - Passengers traveling to Europe should prepare themselves for longer security lines by the end of the month: Starting Jan. 31, airports in the EU will be using liquid scanners to examine carry-­on baby food, medicines and diet liquid products. 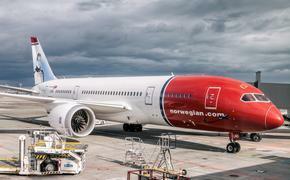 - Be prepared to fall asleep to the roar of engines if you’re planning a trip to San Francisco. Almost all of the downtown hotels are sold out, due to the gigantic J.P. Morgan healthcare conference and it’s various spin­offs, so visitors to the Bay Area are likely to find available rooms either outside the city or near the runway. - Rooms are also scarce in Detroit, as a result of the auto show, and prices are up 20 percent in Miami, as the city plays host to international jewelers, commercial real estate executives and volleyball players. - Room rates for hotels in New Orleans are up 73 percent, as the 2014 convention season gets underway, with mortgage bankers, aviation professionals and Mary Kay reps crowding the French Quarter bars and restaurants. - Members of InterContinental Hotel’s reward program will now have free Internet access at any hotel in the Americas, Asia, Africa or the Middle East without without a reservation. In Europe, the offer is available to Elite members only. - The Courtyard Marriott by the Philadelphia Airport now offers guests a “Park/Fly” package that costs between $139 and $269 and provides free parking for the length of a trip along with a complimentary shuttle that leaves for the airport every 30 minutes. -The average price for a car rental is down 2 percent this week, but prices are up sharply in Miami (up 14 percent), Nashville (up 33 percent), Detroit (up 38 percent) and Phoenix (up 26 percent). 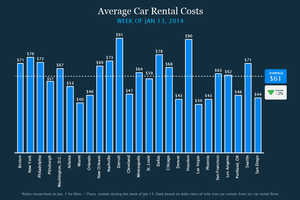 0 Travelers will pay less than they did last week for a rental in Las Vegas (­24 percent), San Francisco (­40 percent) and Orlando (­14 percent), but overall prices for daily rentals are up 17 percent since early December. 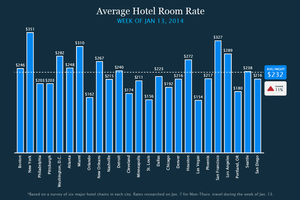 - Hotel prices jumped $19 on average since last week and are just $12 cheaper than the higher rate we've seen since we began tracking ($244 on average the week of Nov. 18, 2013). 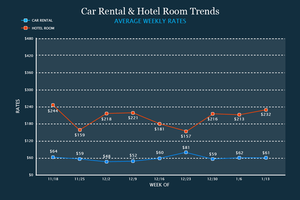 - Car rentals dipped slightly, dropping $1 since last week.